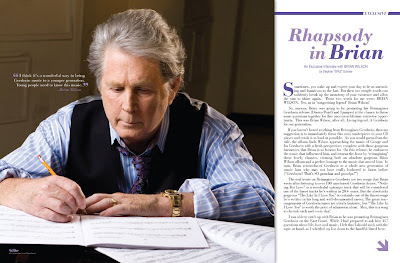 Discussions Magazine Music Blog: An EXCLUSIVE interview with BRIAN WILSON! An EXCLUSIVE interview with BRIAN WILSON! Sometimes, you wake up and expect your day to be as unexciting and humdrum as the last. But then two simple words can suddenly break up the monotony of your existence and allow the sun to shine again. Those two words for me were: BRIAN WILSON. Yes, as in ‘songwriting legend’ Brian Wilson! So, anyway, Brian was going to be promoting his Reimagines Gershwin release (Disney/Pearl) and I jumped at the chance to throw some questions together for this once-in-a-lifetime interview opportunity. This was Brian Wilson, after all. Living legend. A Gershwin for our generation. The real treats on Reimagines Gershwin are two songs that Brian wrote after listening to over 100 unreleased Gershwin demos. “Nothing But Love” is a wonderful uptempo track that will be considered one of the finest tracks he’s written in 20+ years. But the absolutely gorgeous “The Like In I Love You” is certainly one of the finest songs he’s written in his long and well-documented career. The great rearrangements of Gershwin tunes are utterly fantastic, but “The Like In I Love You” is worth the price of admission alone. Man, this is a song to cherish each and every day! I was able to catch up with Brian as he was promoting Reimagines Gershwin on the East Coast. While I had prepared to ask him 457 questions about life, love and music, I felt that I should stick with the topic at hand, so I whittled my list down to the handful listed here. SPAZ: What inspired the Reimagines Gershwin project? BRIAN WILSON: We had always sort of kicked around the idea of doing something with Gershwin songs. When we signed with Disney, we talked about it and then we just ran with it. SPAZ: Was it easier or more difficult to approach and reinterpret these songs than it normally is to arrange a batch of new self-penned tunes? BW: It was more of a challenge to me because I wanted to do it justice for George and Ira. I wanted them to have been proud of this album. SPAZ: You’ve been working with a band of great musicians. How did they feel about this project when you first put the idea forth? BW: The band thought it was a fantastic idea because they all love Gershwin music as much as I do. SPAZ: The album has a beautiful flow to it. Before you commenced recording, was there a pre-conceived idea on the tracklist or did you put it all together after the tracks were recorded? BW: A bit of both. Part was preconceived but we recorded all of the tracks before we figured out the lay out of the album. SPAZ: You listened to hundreds of Gershwin piano demos and created two wonderful tracks from that experience. What was it like listening to these unreleased melodies from a musical legend? SPAZ: At the end of the day, are you hoping that this project will introduce (or re-introduce) the brilliance of Gershwin to your Rock ‘n’ Roll fan base? BW: I think it’s a wonderful way to bring Gershwin music to a younger generation. Young people need to know this music. SPAZ: When thinking back to the first times you heard these Gershwin songs, were you enchanted by the melodies, the lyrics or the original arrangements? BW: I was enchanted by all three!! SPAZ: Is it flattering to know that you are often mentioned in the same breath as other songwriting legends like Gershwin? BW: It’s a thrill to hear that, of course! SPAZ: Are there any plans in the future to work your magic on other classics from legendary songwriters? SPAZ: What’s next for Brian Wilson? BW: I’m looking to do something with the Disney catalog. Classic Disney songs. SPAZ: What do you currently have spinning on your CD player? BW: Oldies but goodies, of course!